A recent trip to London provided an opportunity to try the Polar Instant iPhone app at one of Source London’s charging points. The Leaf’s satnav directed us neatly to the hidden wonders of Q-Park’s Chinatown car park. The underground garage is convenient and very secure but pricey at £36 a day, unless like us you use Q-Park’s arrangement with major London theatres which halves the cost. 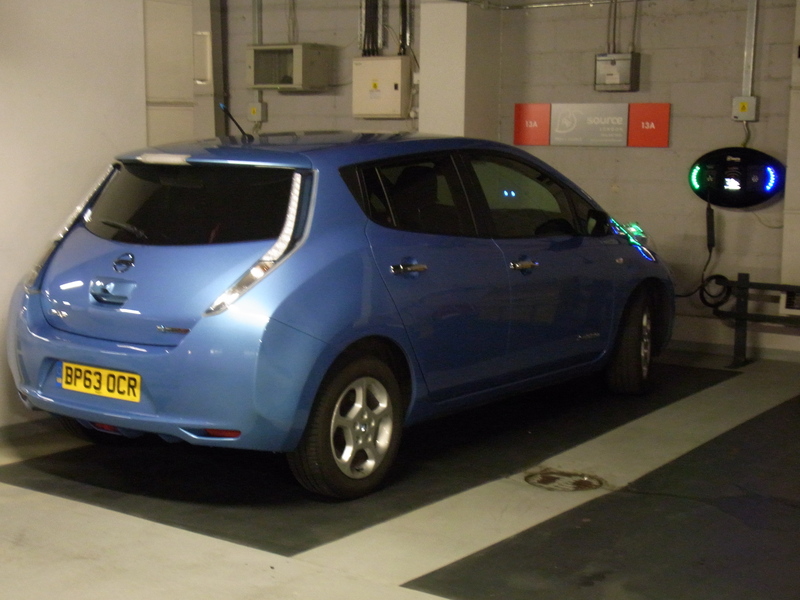 There are plenty of Chargemaster charging stations and they seem to be monitored by staff to avoid ICEing. Polar Instant is not a bad system in principle but it did take us about 15 minutes to get the charging started. The app itself worked well; there was a good signal on ‘3’ even though we were underground. The app offered us a choice of charging points in the car park, identified by four-digit numbers. The identifiers on the charging stations themselves are not that prominent but reasonably easy to find if you have good eyesight. It’s a bit tiresome that the Polar Instant app requires you to put £20 credit on your account even if you only ever intend to use chargers that are free of charge (so to speak); still, the top-up process was slick and I was able to start the process in seconds. This is where it started to get complicated. I had to wait maybe 30 seconds or so before the flap over the 13A socket opened and the charging station invited me to connect. I did. Then there was another long wait of a minute or two before the app announced that it had been unable to start the charge. I went through this process twice more before moving the car to another charging station and starting again. The first attempt failed again, and the family was starting to get restless. Second attempt: success! So satisfying to see the blinking blue lights on the car dashboard! Normally I use the Ecotricity rapid chargers en route, but on an occasion like this where the car is going to be parked for several hours the 10A supply is perfectly adequate; 32A is available for those who have the right cable. Thanks to the strong 3G signal we were able to use Carwings to check progress, and the charge completed before we left the theatre. Although there were plenty of chargers available I left a note on the dashboard with my telephone number – this seems like good etiquette. On the way home we stopped at Winchester Services for a rapid charge, only to find a Ford Fiesta straddling the two parking spaces for the Ecotricity charger! Fortunately there was just room for my wife to squeeze the car into one of the spaces while I stood ready to connect the charger. The space was so tight that my wife had to remain in the car throughout. Suspecting that the culprit might be staying at the nearby Days Inn I spoke to the manager in the hope that they might record the registration numbers of their customers’ cars. No such luck, so I left a note (remarkably polite in the circumstances) on the offending car’s windscreen. Afternote: the aforementioned wife thinks this post is ‘unnecessarily detailed’ (polite version) so feel free to comment; personally I suspect there are others in the EV community who are equally obsessed!